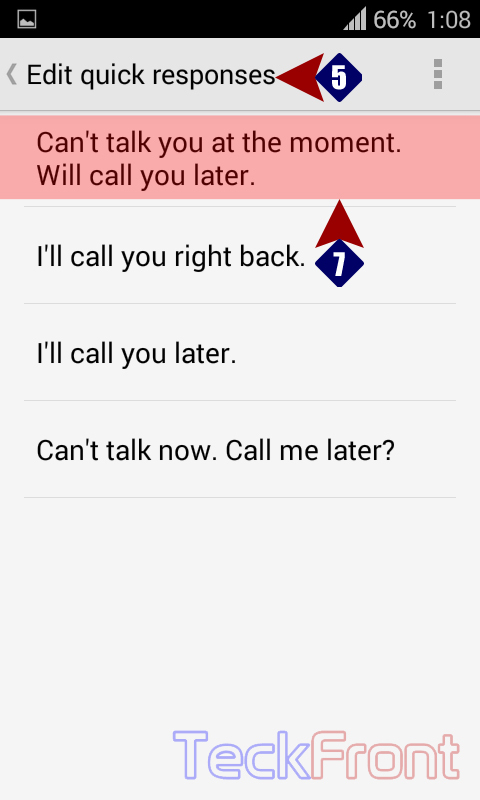 How to Edit Messages for Quick Response to the Caller in Android Phone? If you want to Edit / modify / amend / change / rewrite the messages which have been added in the Android KitKat 4.4.2 as ‘Quick response’, you may modify one or all of the messages, easily. Command Line: Phone Dialer > Settings > Call settings > OTHER CALL SETTINGS – Quick responses. 1: Tap the ‘Phone Dialer’, available on the Home screen of your Android Phone. 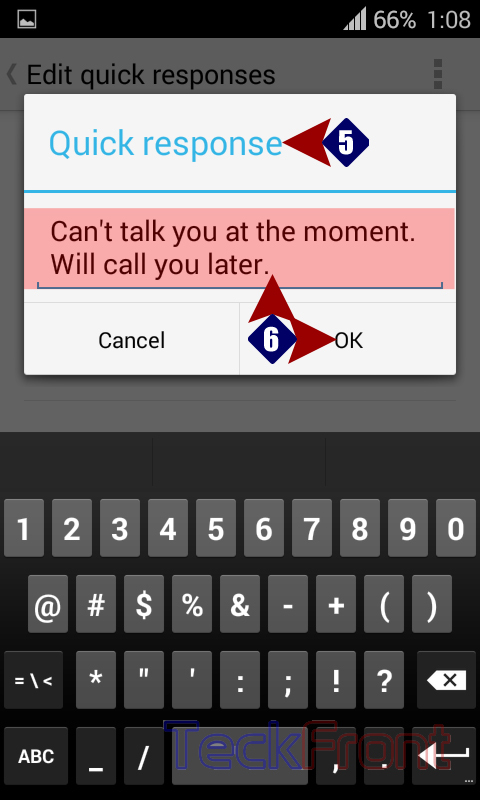 2: Tap the ‘Settings’ button, available at the right bottom of the ‘Phone Dialer’ screen to open up a popup menu. 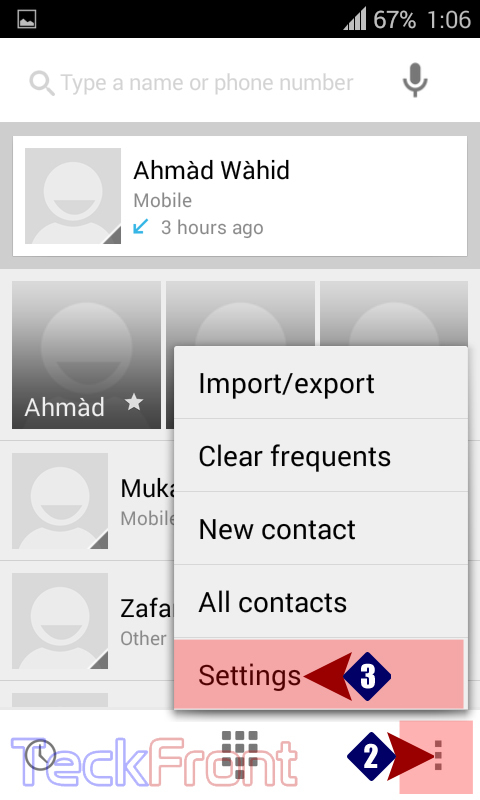 3: In the popup menu, tap the ‘Call settings’ to open up the call settings screen. 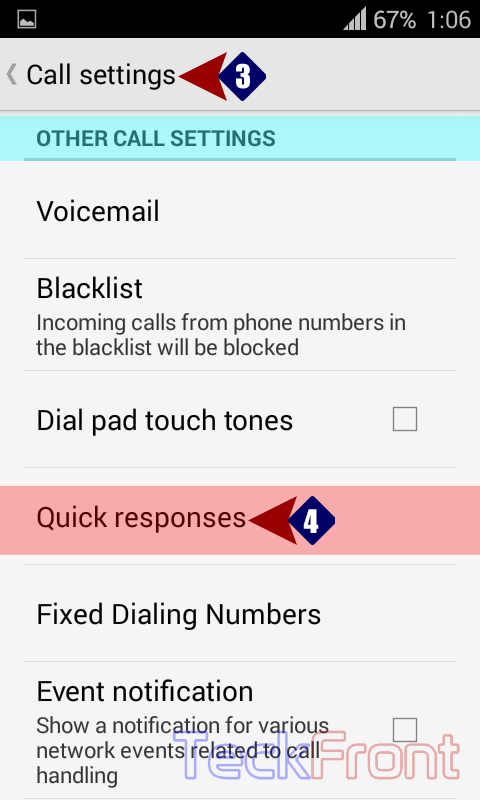 4: At the ‘Call settings’ screen, tap the ‘Quick responses’ under OTHER CALL SETTINGS to open the ‘Edit quick responses’ screen. 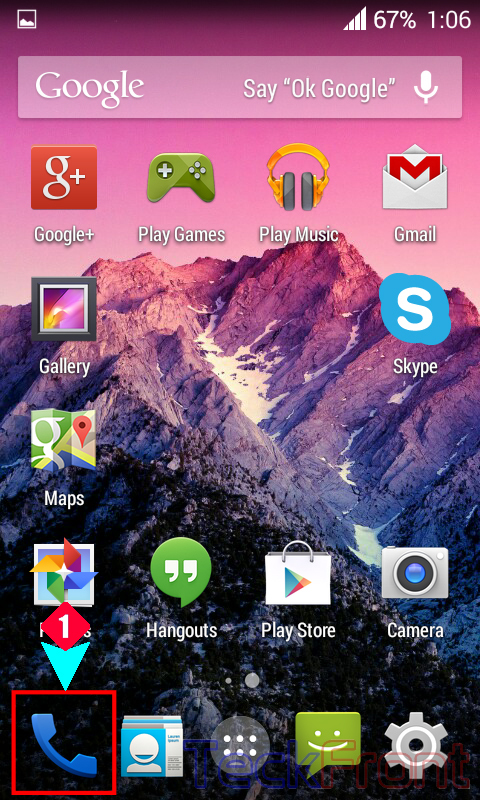 5: At the ‘Edit quick responses’ screen, you will see four different messages, set by KitKat. If you want to change the wording of any of these, tap it to open a prompt with keyboard. See, I tapped the ‘Can’t talk now. What’s up? 6: Here, you may rewrite / edit the message and save it by tapping ‘OK’. 7: See the Message has been edited and changed for use by the user for the quick response. That’s all! 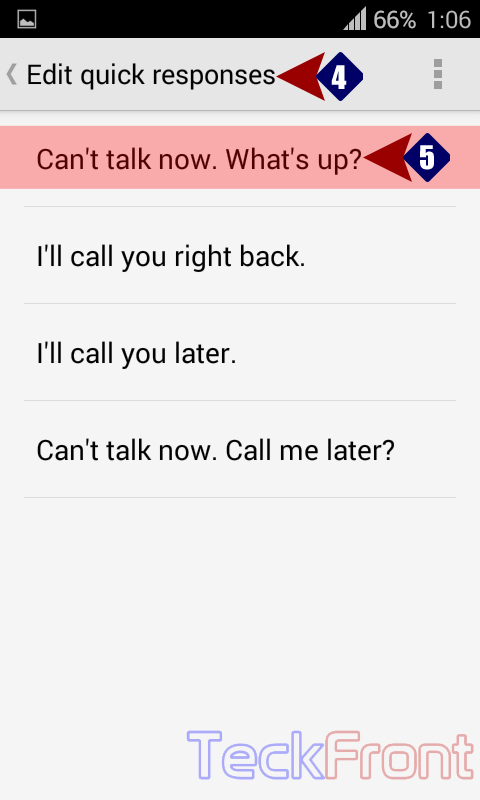 Newer How to Set Call Waiting in Android KitKat 4.4.3 Phone? 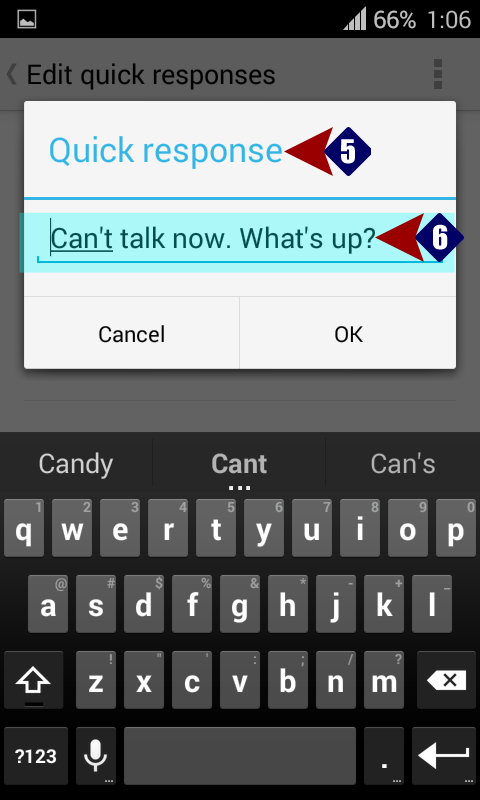 Older How to Answer a Call with SMS-Quick Response-in Android KitKat phone?